This letter was written by Pvt. Eli Burke Norton (1839-1915) of Co. D, 14th Vermont Infantry. He was the son of Julius C. Norton (1813-1875) and Abigail Miller Williams (1817-1889) of West Haven, Rutland County, Vermont. The 14th Regiment was formed at Brattleboro, Vermont in October 1862 and mustered into the army for 9 months service in response to Lincoln’s call for more troops in August 1862. They were rushed to Washington D.C. to bolster the capitol’s defenses after McClellan’s disastrous failure on the peninsula in front of Richmond. They were on picket duty near Occuquan Creek in Virginia late in 1862, then moved to Fairfax Court House where they tangled with Stuart’s Cavalry. They remained there until late March 1863 and then returned to Occuquan Creek before participating in the Battle of Gettysburg on the 2nd and 3rd day. Together with the 13th and 16th Vermont regiments, they helped turn back Pickett’s charge, capturing hundreds of Virginians in Cadmus M. Wilcox’s brigade. The men of the 14th Vermont were mustered out of the service on 30 July 1863. Eli wrote the letter to his cousin Em [Emily] who is otherwise unidentified. She presumably lived in Rutland County, Vermont. I received a letter from you a few days ago. It found Eli well and enjoying himself we as could be expected for soldier boy. I should [have] answer[ed] this ‘ere this. Business before pleasure is the motto here. I have a good deal of work to do now. I can’t get time to scribble much to my friends for I have give up my time to the government for the term of nine months. You may think that I am sick of this warfare from that. If my life is spared, I shall give up my life for the Union till this damnable rebellion is crush[ed] out of existence. I never shall enlist again. I shall get a Roving commission [so I can] go where I please [and] have my own way. I hope we shan’t go into battle for I don’t want to get very nie to such balls for they shoot cursed careless. I have been where the balls came close enough for my conscience for Eli. I expect that we will go to the front. We had our tents taken from us day before yesterday and we are under marching orders with 7 days rations, 3 to be cooked and carried in our haversacks. I expect that we will see plenty of fun in a few weeks. Some of us will be laid in Virginia. Such things will happen in war. Em, I wish you could see the long faces that is carried by the boys in this regiment. I suppose they thought that they will go home in honor without seeing any fighting. I hope that some of the brave boys will see plenty of fight. After I had been under fire. They talk more than they had a right to. They let Eli alone and that was the best thing they could do. It rain[ed] very hard yesterday and last night and it rain[s] very hard now. It make[s] the boys cross as the Devil. we have got very few houses to live in now and I don’t expect that we will never see any better one till we get back. I have not taken off my clothes since I came here nor have I eaten a mean of victuals that is fit for anyone except a soldier. Ask Eugene if he wants to be a soldier. Lay on the ground, and see the times that Eli has. I think he had better stay at home but I will let him do as he has a mind. 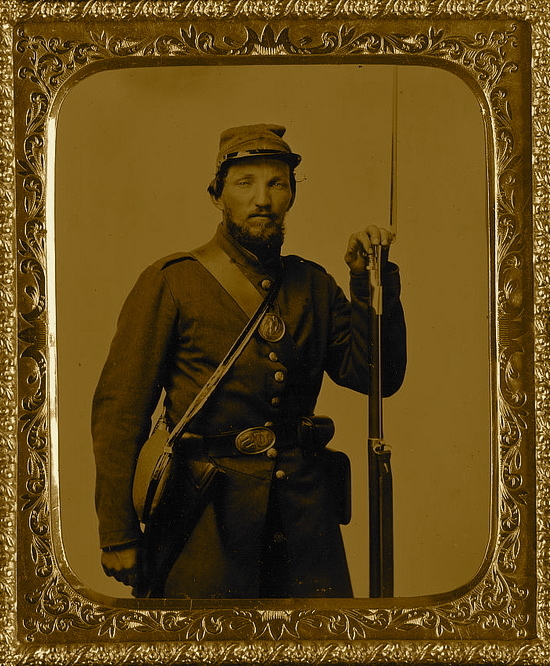 ¹ This was undoubtedly Don Juan Wright of Co. D, 14th Vermont.